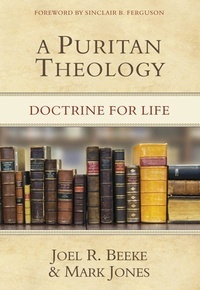 A Puritan Theology: Doctrine for Life offers a groundbreaking treatment of the Puritans teaching on most major Reformed doctrines, particularly those doctrines in which the Puritans made significant contributions. Since the late 1950s, nearly 150 Puritan authors and 700 Puritan titles have been reprinted and catalogued by Joel Beeke and Randall Pederson in their 2006 collection of mini-biographies and book reviews, titled, Meet the Puritans. However, no work until now has gathered together the threads of their teaching into a unified tapestry of systematic theology. A Puritan Theology, by Joel Beeke and Mark Jones, attempts to do that. This book addresses Puritan teachings on all six loci of theology, covering fifty areas of doctrine and explores Puritan teachings on biblical interpretation, God, predestination, providence, angels, sin, the covenants, the gospel, Christ, preparation for conversion, regeneration, coming to Christ, justification, adoption, church government, the Sabbath, preaching, baptism, heaven, hell, and many other topics. The goal of A Puritan Theology is to increase knowledge in the mind and godliness in the soul. It was written for theologians, historians, pastors, and educated laymen who seek to learn more about Puritan theology.